Leading up to the start of the fall semester, FIU News will be highlighting several standout members of the Class of 2022. When incoming freshman Gisell Rodriguez first stepped foot on campus, something felt right. “There was a spark,” she said. Gisell Rodriguez, the valedictorian at Glades Central High School. Rodriguez, valedictorian at Glades Central High School, hails from Belle Glade in Palm Beach County. Because of the several AP and dual enrollment courses she took during her time in school, her graduation may even come sooner than 2022. Rodriguez is a part of FIU’s best freshman class in university history. 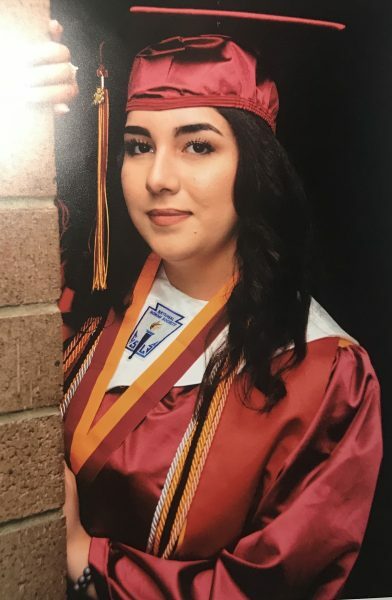 The first in her family to attend a university, she will be a student in the FIU Honors College and will be pursuing a psychology degree in the College of Arts, Sciences & Education. “I plan on continuing my education and getting a specialist’s degree in school psychology here at FIU as well,” she said. Her dream job is to work with elementary school kids with special needs back home in Palm Beach County. Rodriguez volunteered at the Very Special Arts Festival, which provides students with disabilities with a day full of fun art activities. From the face painting and silly dancing to playing with musical instrumentals, seeing the kids enjoy themselves was inspiring to Rodriguez. Rodriguez was admitted into almost every school within the state; an accomplishment of which she is very proud. “We have a lot of competitive scholarships,” said Christopher Damaso, recruiter for the Office of Admissions. “We want to make sure that they are supported financially so that they can get the most out of their experience —whether it is by living on campus, especially for her since she’s a little bit further north, or to make plans to study abroad,” he added. Rodriguez plans to study abroad on an Honors College trip to Spain. “The fact that we have students who are valedictorians and want to pursue their studies here – it shows that FIU is a challenging atmosphere where students are going to go ahead and learn a lot,” said Damaso. Although she is frightened by some of her upcoming courses, such as statistics, she is open to taking classes outside of her comfort zone, such as forensic psychology, to explore her inner criminal investigator. In the meantime though, Rodriguez is still figuring out her way around campus. “It’s huge and so confusing!” she joked. And in the coming weeks, what once seemed big and confusing will become ever-familiar to her and many other freshmen.